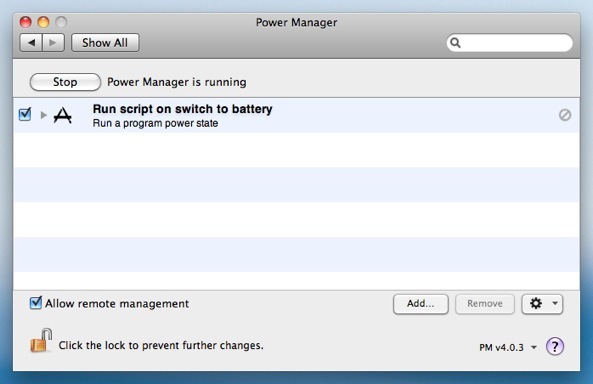 You can use Power Manager to run an AppleScript when you disconnect your Mac from mains power and start using battery power. Running an AppleScript when your Mac laptop's power source changes is surprisingly useful. With this ability, you can turn on and off power hungry services and settings, launch applications, or just warn the user that the power cord has come out. To run the AppleScript we will be creating an event using the new power state trigger; this trigger was introduced in Power Manager v4.0.3. For this example, the AppleScript will be separate from our event. Launch AppleScript Editor: Applications > Utilities > AppleScript Editor. When run, this AppleScript will create a new event in Power Manager. The event will contain one trigger and one action. The trigger tells Power Manager to trigger the event when any power source's state changes to "battery" powered. The action launches the application stored at /Users/Shared/MyScript.app. say "Switched to battery power." Save the script as an Application to /Users/Shared with the name MyScript.app. 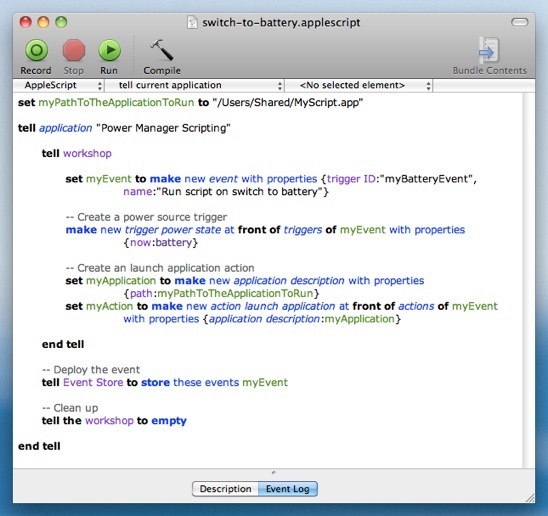 With this simple AppleScript application in place, your Mac will say the phrase "Switched to battery power." each time the mains power cable is removed. Of course, you can go on to extend this short AppleScript to make it do much more. This article was posted in AppleScript, Energy saving, PM4, Power Manager, and Recipe and tagged AppleScript, battery, Power Manager, power state trigger, and recipe.